Board Report was a newsletter-style digest of news, tips, and recommendations to improve workplace efficiency, relationships, and effectiveness. It was geared towards graphic designers and other decision makers who needed to survey vast amounts of information and determine which items had value for them. That task can be daunting and waste lots of time. Board Report surveyed numerous sources and reprinted the gist of the items that had value. It was written in a breezy style and was a joy to scan and read. But, the editor acknowledged that the layout was a bit stodgy and didn't use the given 8.5 x 11 page. He asked for suggestions from the readership. 1. 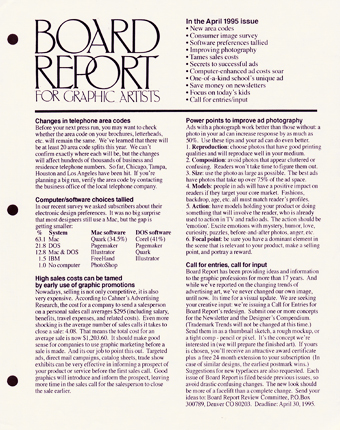 Logo: some awkward letterforms - the P in report had its stem reaching below the baseline and obscured within the text below. The body of the P became a D - not enough to adversely affect readability, but enough to look ganky in a newsletter for designers. 2. Outline around the logo: dated as being very 70s. A popular graphic treatment that transcended psychedelia and eased into mainstream corporate design. It made the look old and out-of-touch. 3. Column width: too wide - a comfortable line length for easy readability is about an alphabet and a half - 40 characters. 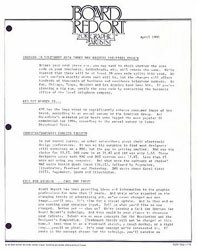 Board Report had a column width of about 65-70 characters. 4. Layout: used all caps for its headings, but in a font that didn't work well in all caps. Roman serif fonts with their thick and thin letterforms don't read well when set in all capital letters. The headings need to encourage rapid scanning. 5. Typeface: standard typewriter serif fixed-width font. 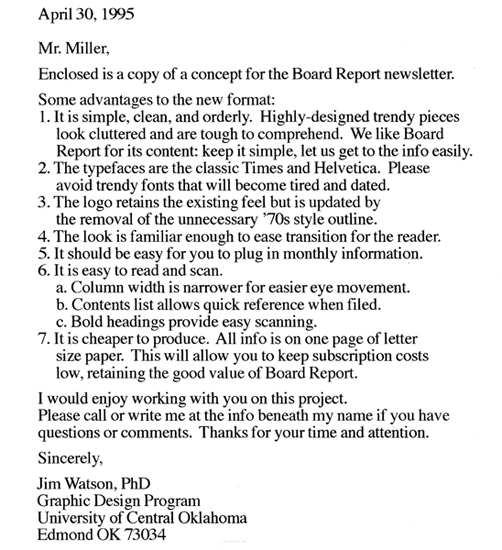 I sent in the proposed design to the editor/publisher of Board Report. He didn't adopt the recommendations but he did write a nice letter of thanks and admiration. 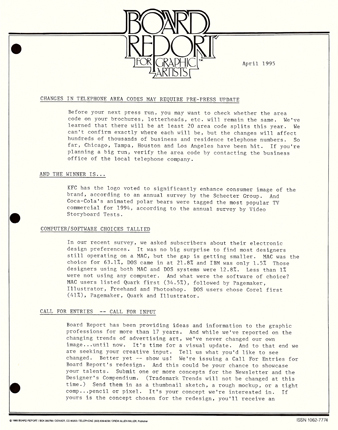 The newsletter ceased publication soon after.